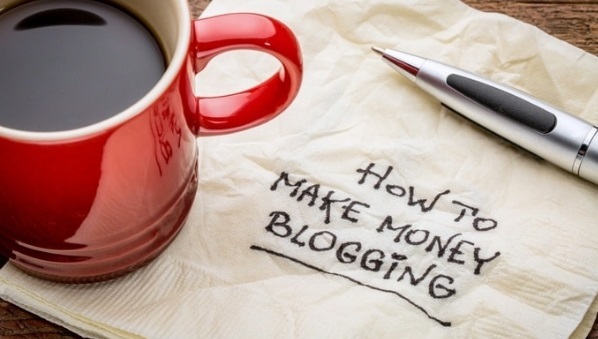 After creating your blog, getting a domain name/hosting, building your authority and traffic, then you can start talking about monetizing the blog. I blogged for more 6 months and then I made my first $50 from blogging. Before then, I was already making money on my blog, selling my e-books and offering some services. After then, I landed my first advertiser and then it continued that way. Every new blogger has this tendency to install an advertise here widget on their blogs. I even faked a stats for my blog...Lol. You can imagine a blog still using a .blogspot domain claiming it was getting a hundred thousand minimum unique visitors. I got many clicks but no one contacted me for ads. I took it down, got my first domain and started selling my products and services. I didn't have any AdSense on my blog because they kept on disapproving me, but when I had known the rudiments of blogging, I started getting AdSense approval in three days. Life's really become easy. I recommend everyone should get a copy of this e-book, The Successful Blogger. We outlined so many things you need to know about blogging, especially how you can start making above $150 blogging a month. It's very affordable, and available for instant download. This post is just an extract from the book. What Are The Best Ways To Monetize My Blog? There are so many ways to monetize your blog, and they are all written in this e-book. However, we have written some of them here, and we believe they can help you a long way. 1) Affiliate Marketing: You can make a lot of money doing affiliate marketing, whether you have a blog or not. You just need to sign up for any of the affiliate companies and get paid to promote products via a unique url. The most popular affiliate companies in Nigeria are probably Konga and Jumia, but they are not the only. You almost need no capital to begin it and it's one of the most profitable online businesses in Nigeria. If you have issues generating sales, then you need to checkout this post. You need a lot of wisdom to succeed in this business. Know your target audience, for example you should know that females will patronize more fashion products and do on. 2) AdSense: AdSense approval is every bloggers dream, and it has made many quit. It is a form of ad network, even if many people don't count it as one. It is owned by Google and probably the largest ad network in the world. They like any other ad networks, act as an intermediary between you (the publisher) and your advertisers. They help you collect the money, thereby minimizing scams and pay you based on your effort, as determined by your clicks and impressions. If you're still having issues with AdSense approval, then you deserve a copy of our e-book, Making Millions In Your Dark Room. You will not only get yours approved, you can even start getting approval for others. AdSense is not as difficult as people say. 3) Ad Networks: The AdSense we explained above is a typical example of an ad network. They act as an intermediary between you and your advertisers. There are different types and they can pay you based on clicks, impressions or even both. Some examples include Bidvertiser, Juicy Ads, Info Links and many others. 4) Sponsored Posts: When you have gotten some good stats on your website, then you can comfortably opt in for sponsored posts. Some big sites like Naijaloaded and Nairaland get massive traffic so much that they only monetize their site via this method. Others like Naija.ng and LindaIkeji's Blog combine monetizing methods and their's no harm in it. You can approach companies personally via emails or set up an advertise here page, or even do both. Make sure to include some attractive details of your blogs stats but avoid lying, you will surely get caught up. You can also join relevant Facebook groups for bloggers or sign up for a site like Valued Voice. 5) Selling Your Products And Services: Recall that I said earlier that it took me 6 months to make my first money from my blog, before then I was already monetizing it through my products and services. That is one of the best ways to do so, and you cannot be stopped by ad blockers and other annoying software that frustrate bloggers.